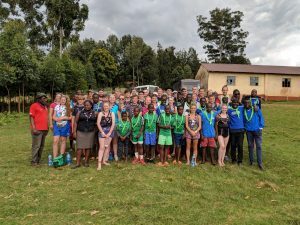 In August 2018, 33 Explorers, Network members and Leaders from the 23rd Bromley went on an unforgettable expedition to Kenya, alongside Harambee for Kenya. 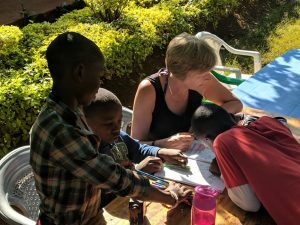 Harambee for Kenya are a UK based charity who have a number of safe houses in Kenya where they take homeless boys off the street and give them accommodation and education. 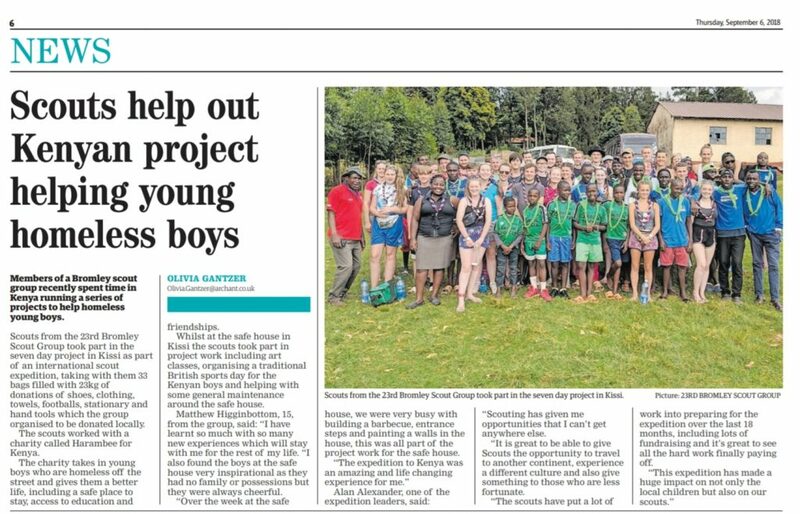 More details about the charity can be found at: http://www.harambeeforkenya.org/. 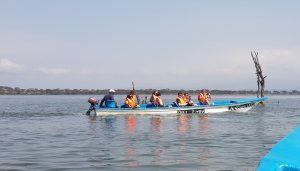 “The expedition to Kenya was an amazing and life changing experience for me. 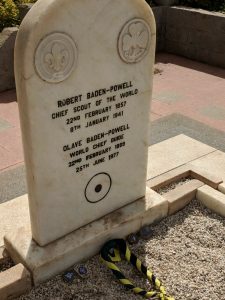 We started the trip with a visit to Robert Baden Powell’s grave in Nyeri where we reflected on Scouting. 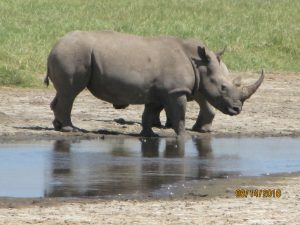 We then continued on our journey with a Safari in Nakuru where we saw many wild animals such as zebras, buffaloes, elephants and baboons! We finally arrived at Harambree for Kenya’s safe house at Kisii which was our home for the next week. Over the week at the safe house, we were very busy with building a barbecue, entrance steps and painting a few walls in the house, this was all part of the project work for the safe house. When we were not working we watched a football match which the boys played in and visited a soapstone shop. Also during our stay we had a chance to go on a night tour to see homeless boys on the streets. Any left over time we spent with the boys either playing games or getting to know their stories. The time at the safe house quickly flew by and it was time to continue our journey. It was hard leaving the boys because we grew a very tight bond with them but it was nice to know that we left with a sense of achievement after making their lives a little happier. The remainder of the trip was spent on a hippo boat tour, at an elephant sanctuary and at a giraffe centre where we had a chance to feed them! We also went to a carnivore restaurant, with “all you can eat” meat, where there were some unusual meats such as crocodile, rabbit and oxen testicles which they carved in front of you! The next day it was sadly time to fly home.